Desktop computers, laptops, tablets and mobile phones, in combination with the Internet, are the new file drawers, books, encyclopedias, libraries, marketing tools, community meeting places, healthcare tools, and more. Electronic devices can be adapted in countless ways. Some more useful than others. How can individuals and healthcare advocates get the most out of the technology? Find out in this issue of JointHealth™ monthly. Whether you think social media is a valuable resource or a time-waster, it is transforming the way we communicate with people all over the world. People spend hours on their computers and smartphones, so from the point of view of organizations with a message to share, social media is a primary way to connect with audiences. Organizations that successfully use the Internet and social networking sites include the American Red Cross and the Mayo Clinic. Using innovative and widely different strategies, they built their profiles to drive people to take action to support their causes. The Mayo Clinic’s strategy was also simple. They published press-ready videos that could be used in traditional TV news, for pitching stories to the media, and for providing information to patient communities quickly. They are also active on Twitter, Facebook, and several blogs. Their strategy was so successful, they developed the Mayo Clinic Center for Social Media to “improve health globally by accelerating effective application of social media tools throughout Mayo Clinic and spurring broader and deeper engagement in social media by hospitals, medical professionals and patients.” For more information, visit socialmedia.mayoclinic.org. The brilliance of social media is that you can either be an active or passive participant. Anyone can watch arthritis videos on YouTube, read discussions on Facebook pages, and stay up-to-date on arthritis events via Twitter. Alternatively, if you have the time, prowess, and inclination you can be an active participant and become involved in whole new advocacy communities. 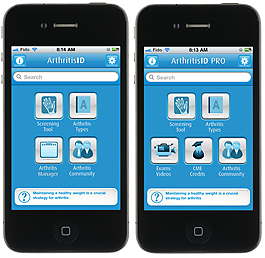 With these new levels of accessibility and communication, becoming an advocate for arthritis now lies at your fingertips. Have you heard of eHealth? It is short for electronic health, and it means using computers and other electronic devices to communicate and share health information. Its uses can range from administrative, such as entering medical notes into a database to track patients’ health, to direct healthcare delivery through apps. Electronic health allows patients to be more involved in their own healthcare and makes it easier for institutions and healthcare professionals to share information with each other. For example: on your healthcare team, you may have a physiotherapist, a rheumatologist, and a pharmacist, each working in different parts of your province at different institutions (a downtown office, a university hospital, and a pharmacy). Electronic health makes it far easier for information to be shared amongst all these aspects of your healthcare and, importantly, with you. Basically, eHealth is making use of information technology for health-related services, education, and research. Governments to track statistics, such as the number of people who have a type of disease. The data can help determine how much funding is needed for diabetes or arthritis, for example, and to what extent services will be required for the disease. Patients the opportunity to communicate with other people who live with the same disease. Through social media, for example, they can learn each other’s experiences and find out how others cope. This is a wonderful tool, especially for people who live with rarer diseases. You may not come across very many others with lupus, for example, in your community, but online you can connect with people from all over the world. It can help people feel less isolated in their experience of their disease. Electronic medical records can be mined for clinical information that could be used for research. How popular are social networking sites? This doesn’t even include Flickr, Reddit, MySpace, Instagram, Pinterest, Foursquare. . . . and the list goes on. Despite that over 4.5 million Canadians live with arthritis, it is not considered a ‘status’ disease. That is, arthritis is not as high profile as cancer or heart disease, even though it affects more people and certain types are life-threatening. Treatment continues to be unequal across Canada. The money that goes into arthritis research is a fraction of what goes into searching for a cure for cancer or HIV. What worked for getting cancer well known and taken seriously by the general public? It affects people of all ages and just about everyone knows somebody with a type of cancer, so everyone is at least slightly afraid of it. And when people get sick from it, it shows. It feels close. Arthritis may not. Part of the problem is that there are so many misconceptions about arthritis. Largely dismissed as a disease of the elderly, generally, people do not realize that any one at any age can get arthritis. Though it is not always visible, arthritis is painful and often debilitating. Sometimes it is thought to be just aches and pains, that people who have it are somehow not tough enough, or that arthritis could easily be controlled by following a certain diet and exercise routine. Because it may not be taken very seriously or is simply not well known, people who have it are uncomfortable talking about it. Because they don’t talk about it much, there’s the illusion that it’s not that prevalent or that it’s not that serious. What can be done to end this cycle? It is crucial that patients share their stories, create discussion, put information out there, and be heard. Using social media to do this will increase the profile of arthritis in Canada. The more powerful the arthritis community becomes, the better chance arthritis has of becoming a status disease. Twitter, Facebook, YouTube, and blogs are among the many social media platforms that can be used as advocacy tools. They are ways to share personal stories, valuable information, and events. Through these media, people can learn about the issues and get involved. Join a social networking website, create advocacy groups, follow and contribute to arthritis blogs or start your own blog. In short: share your arthritis story and help raise awareness. We have to build the advocacy community, using every tool we have. Nothing will change until the arthritis community advocates for the government to pay attention to the millions of Canadians suffering from this debilitating disease. Social media allow for social interaction - and action - in real time. If you become involved, you can help change the political, social, and economic landscape for people living with arthritis. Please go to the JointHealth™ ‘taking action’ tab to become an active participant in disease advocacy. Use the tools provided to write to your MLA and bombard the newspapers with letters to the editor. ACE has provided tips and templates to do just that. One letter represents thousands of people in your province. The power of the pen is not dead, and now it has expanded to include the power of online communities self-advocating via social media. We welcome contributors to the Arthritis Broadcast Network. Please send your blog posts to feedback@jointhealth.org. Or simply like, share, or comment on other posts at arthritisbroadcastnetwork.org. Another form of eHealth is smartphone and tablet applications (‘apps’) that promote and help maintain health. This growing new technology is taking over the world of healthcare. From apps currently available that can track your calorie intake to those that can track moles for skin cancer, and upcoming apps that will help you take your blood pressure or monitor your heart rate and other vital signs, there is no limit to their potential. This food diary and exercise tracker gives the calorie count for more than 2 million foods, including from Canadian companies. With its ability to read a food product’s barcode, you can simply scan it and all the nutritional information about the product is automatically transferred to the diary. Another neat feature of the app is that you can do this with a friend, since it allows you to share your progress and motivate each other. It tracks your workout routes as you walk, hike, run, cycle, and more using GPS on your phone. As you go it records duration, distance, pace, speed, and elevation. Indoor workouts can be tracked as well by directly entering information about your activities. It also records calories consumed and burned, but the options for the food diary are limited. There are a number of similar apps - some free and some not - that are specific to certain kinds of workouts, such as MapMyDogwalk, MapMyRide, and MapMyHike. There is a free version and a 99 cent (at time of printing) version. We have not tried the paid one, but the free app gives plenty of exercises and is more than useful. It provides numerous exercise routines that allow you to focus on certain muscle groups. If you want even more features like video demonstrations and the ability to track your heart rate, then the paid version may be better for you. None of the exercise routines are tailored for people with arthritis, though, so we advise checking with your doctor or physiotherapist before trying the exercises. It allows you to check symptoms, identify pills, and look up information about conditions, medications, treatments, and first aid for medical emergencies. It also provides local health listings, but does not include Canadian hospitals, doctors, or pharmacies. Is it a time waster or a valuable resource? Send us your views at feedback@jointhealth.org. Over the past 12 months, ACE received unrestricted grants-in-aid from: Abbott Laboratories Ltd., Amgen Canada, Arthritis Research Centre of Canada, Bristol-Myers Squibb Canada, Canadian Institutes of Health Research, GlaxoSmithKline, Hoffman-La Roche Canada Ltd., Janssen Inc., Novartis Canada, Pfizer Canada, Sanofi-aventis Canada Inc., Takeda Canada, Inc., and UCB Canada Inc. ACE also receives unsolicited donations from its community members (people with arthritis) across Canada.